I’ve been a big fan of J. Crew cardigans since about age 20. That was probably a little young to jump into a cardigan phase, but by now I have gathered a nice little collection from which to choose “completer pieces” (as Stacy & Clinton would say). All summer I searched for a great red cardigan. I ordered two or three, but they were all a little too orangey. I wanted a bold red that could almost work as a neutral. 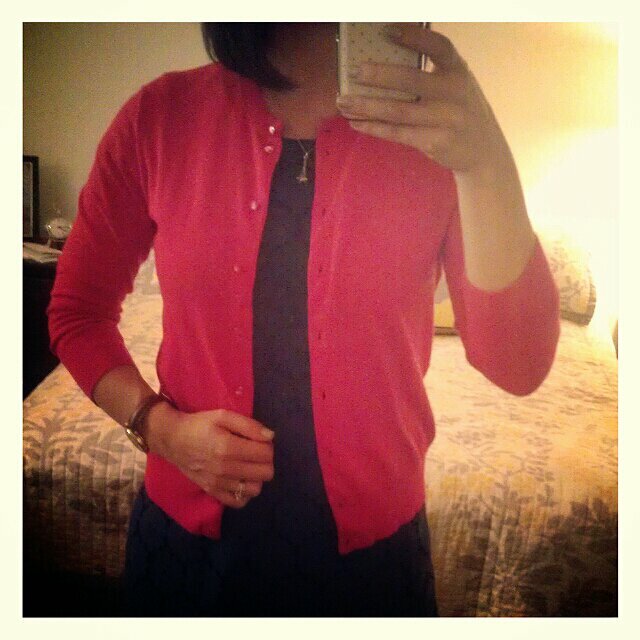 This one is a Jackie cardigan in Authentic Red, and as soon as the weather finally falls below 90 degrees, I plan on getting a lot of use out of it. I think every teacher needs a perfect red cardigan. For some reason, adding a one just seems to make an outfit that much more “teacher-y.” What would you pair it with?